Aluminum metal address plaque personalized with up to four large 4" numbers. 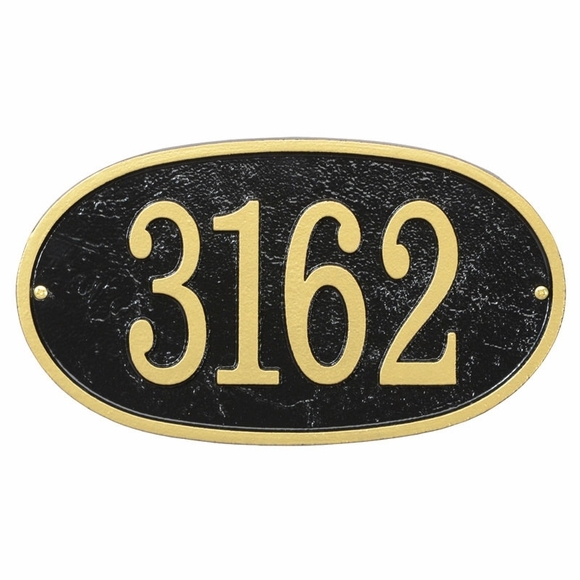 Our most popular and value priced metal address sign series. Choose shape from arch (12"W x 7.25"H), oval (12"W x 6.75"H), rectangle (11"W x 6.25"H), or vertical (3.5"W x 19"H). All plaques are 1/4" thick. Mounting hardware included. Choose color bronze with gold numbers, black with gold numbers, green with gold numbers, or black with silver numbers. Border matches number color. All weather powder coated finish. We can include numbers only on these particular address signs - no letters, hyphens, symbols, or punctuation (but don't worry we have plenty of other signs you can include them on). Made in USA. Comfort House # MFA0027. Please allow 1-2 weeks for delivery.